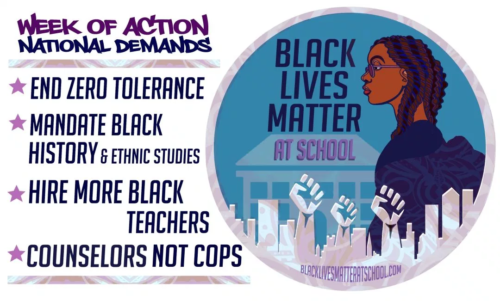 The #BlackLivesMatter at School Week of Action launches today nationwide, running through February 8th. Although this week of action has occurred annually for the past few years, 2019 culminates a year fraught with school district-wide strikes and solidarity actions from students, parents and community organizations from West Virginia all the way to Los Angeles fighting against decades of educational injustice. Public school funding has decreased dramatically over the past decade, undermining opportunities for a quality and dignified education, particularly in low-income communities and communities of color. During the 2008 recession, key funding for schools was slashed. Despite economic recoveries in some areas, many districts still provide less total funding per student than before the recession hit. Cuts to state funds and drops in local property taxes resulted in larger class sizes, old textbooks, fewer school staff and teachers, and cuts to instruction time. The truth is, predominantly Black and Brown, immigrant, special needs, and low-income communities bear the brunt of these disinvestments. The legacy of segregation and redlining of neighborhoods has persisted decades after the Civil Rights Movement and we see it manifest in unacceptable learning conditions that disproportionately keep Black youth from their right to a dignified and high-quality education. For many Black students, school conditions are beyond substandard, including but not limited to: dilapidated buildings, molding classrooms, damaged books, unsafe water access, and uncertified teachers. In predominantly Black communities, students must also contend with school police, criminalization and school push-out resulting from zero tolerance policies. Under the current administration, conditions could worsen for Black youth. At the end of 2018, the Federal Commission on School Safety decided to "harden schools" and roll back Obama-era reforms aimed at reducing racial disparities in school suspensions. Josiah Lanzy, a youth leader with the Black Organizing Project in Oakland, CA stated, “I don’t feel like the police are there to protect me, I feel like they are there to target me”. This was Lanzy’s reflection after he was suspended for seven days and visited by police with a citation that now shows on his record. Punitive policies like Josiah’s suspension cost America’s youth in public schools more than 11 million instructional days during the 2015-16 school year, with Black youth losing five times as many days as white students. These policies disrupt the educational attainment and have troubling effects on youth development. They also impact health disparities over time, impacting levels of stress, chronic conditions, and mortality within Black communities. Youth leaders from organizing networks like Dignity in Schools Campaign with the support of parents, educators, and advocates like the Communities for Just Schools Fund quickly responded to the Federal Commission by releasing their own recommendations in “Do the Harder Work–Create Cultures of Connectedness in Schools”, which builds on earlier efforts, and highlights the history and danger of police in schools. This report and the youth organizing behind it from organizations across the country, like Black Organizing Project (CA), Philadelphia Student Union (PA), Racial Justice NOW! (OH), Gwinnett SToPP (GA) and many others uplift what #YouthDemand when it comes to dignified education. They also help transform the narrative of what school safety looks like and call on administration to #DoTheHarderWork and invest in support for teachers and school staff to create a safe and encouraging school climate. Recent strikes, beginning with West Virginia in early 2018, reflect a change in organizing tactics when it comes to school issues, evolving beyond labor disputes to represent the urgent needs of schools and students. United Teachers Los Angeles’s (UTLA) January 2019 strike, for example, represented “a battle for the soul of public education”. UTLA ended their protest with a victory beyond a raise, winning lower class sizes, more support staff, and commitments from the district to invest in socially minded initiatives. The #BlackLivesMatter at Schools Week of Action, which aligns with the first week of Black History month, focuses on similar issues to support Black students first and foremost. 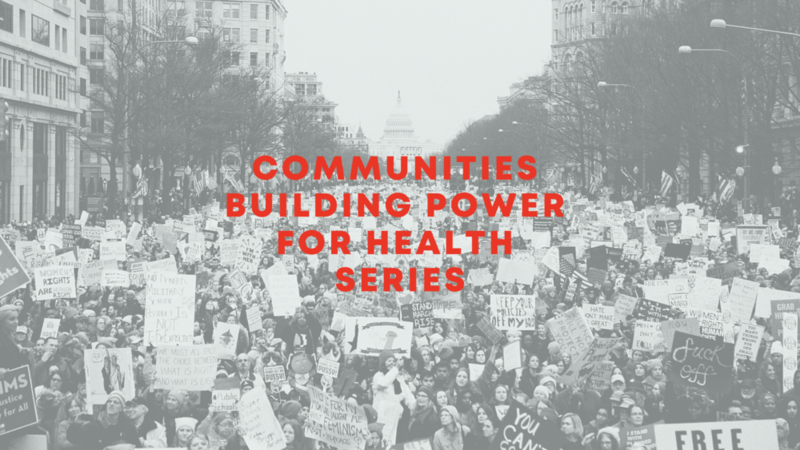 Any progress towards health equity requires us to center those most affected by negative health outcomes and the systems that perpetuate them. Check out the National Black Lives Matter in School Week of Action Starter Kit for more!